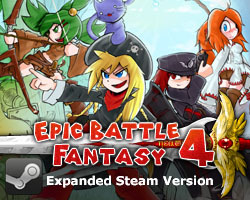 EBF4: Battle Mountain has been released on Kongregate! Battle Mountain is a challenging new area which includes 8 new bosses, new equips, and survival and endurance battles. Everyone who purchased the Premium Pack gets the update for free, otherwise it’s $10. This version now has all of the content that the Steam version will have. But do not fear! There’s also a lot of updates for the free version, including new bosses and music. So it’s worth replaying the game if you’ve wanted to. The Steam version is coming soon, probably before the end of February. It’ll have trading cards, cloud saving, tons of achievements, and all of that cool stuff. Also considering bundling in the soundtrack. 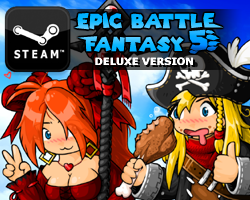 This entry was posted in Epic Battle Fantasy 4, Game News on January 31, 2014 by Matt Roszak. You are certainly one great developer! If I purchase the premium pack, can I get it on Steam for free? Will fix that soon! It’s only visual though. If you do include the soundtrack, I will be yours forever. - Fighting the enemies in the first area of Battle Mountain triggered Matt’s “All of her attacks seem to have a taste of poison to them!” message. It was against a bunch of Obsidian Idols. - Power Metal doesn’t transition as well as it used to from the regular music. - Plasma Cage isn’t stunning the Jumbo sized Obsidian Idols on the first area of Battle Mountain’s wave 3. Not sure if you changed it so it doesn’t always stun or if they’re just immune to it – if they are, their status page does not show that. - Enemies aren’t frozen for my turn when I freeze them on the counter with the Crystal Bow. Still having fun regardless! I’ll post more bugs here if/as I find them. Here’s one more for ya: When Dark Lance casts Nuke, it lands on his side of the field with the party offscreen, exactly the same as a friendly Nuke cast. I’ll have a look into some of those. Others are just quirks and not really bugs. I purchased the Premium Pack back when it came out and have since gotten a new PC. I get Battle Mountain along with the other features, but not the equips. I don’t mind having to start without my old save files, but is there anyway I can get the equips again? Now, you actually have to collect the premium equips, I think. There’s always one of you around, isn’t there? Wow, It’s really tempting to play it now, but I will wait for the Steam release to play it there! please tell me where is Battle Mountain I already zeroed once the game already for a long time but I can use my save game to go to this place or that fasso idea where it is and please tell me where is located this new site I’ll be grateful for the response. I got a bug fighting the Rainbow Rafflesia, it used the Rainbow Beam, and it just froze like that, all the other characters were doing idle animations and such. No damage was inflicted, and I couldn’t leave the battle, had to restart the game. do people who by the premium pack on kongregate get the steam version and the extra for free if they already payed for it on kongregate or do we just have to pay for the steam version of the game and get the extras for free? None of the purchases transfer between services (Kong/Steam). i just looked into this and it turns out that the price has increased from the old pack. i didn’t know about this and i want to know why you didn’t you give (us) a warning about this earlier. i’ve waited until the expansion came out to look at it and plan to get it by then. i felt really disappointed when the pack’s price went up, without any warning. Whoops, sorry about that. I’ll see if I can do a discounted price at some point. Sorry, no plans for AG. The Steam version will have cloud saving though. Would there be a limited time discount on steam? Appreciate it. I have been looking for like this specific. Excellent information I’m going to return for additional information in terms of Paleo Eating plan.